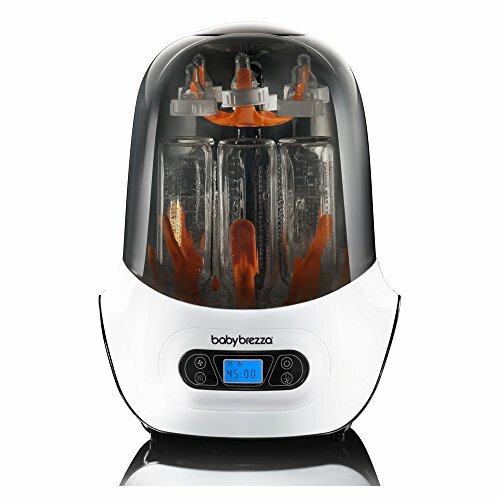 Sterilize and dry your newborn and baby bottles quickly and easily with the One Step Sterilizer Dryer! This universal 4-in1 machine can be used as a Sterilizer only, Dryer only, Sterilizer and Dryer or as a Storage Rack. This electric machine uses natural steam to kill 99.9% of the germs in bottles, pacifiers or breast pump parts in just 8 minutes, then automatically dries the leftover condensation in your choice of a 30, 45, or 60 minute drying cycle with the easy-to-use control panel. The bottles remain sterile for up to 24 hours, or until the lid is open. The One Step Sterilizer Dryer holds up to 6 bottles plus accessories and works well with all bottle sizes. 1 Year Limited Warranty. Automatically sterilizes and dries bottles, pump parts and other accessories in 1 easy step - saving you time!